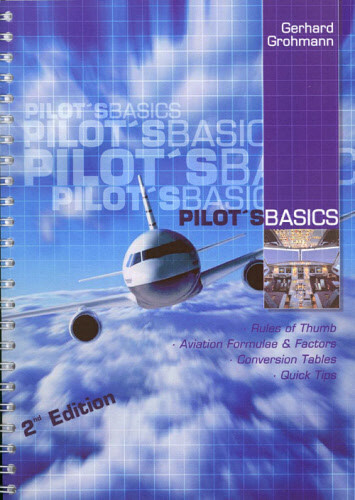 Easy to use Rules of Thumb, Formulae and Factors for every pilot ! Thorough pre-flight preparation and planning is not, on its own, enough to perform a flight safely and at optimum efficiency. Continuous reanalysis of our preparation, and adjustments to the plan to match the dynamic in-flight situation, is essential throughout any flight. This is a basic requirement, whether we are flying an Ultra Light, or a Jumbo Jet. During flight we continuously recalculate and estimate to confirm the accuracy of our planning and calculations, or to fine tune them. In these situations rules of thumb, simple formulae and approximations are extremely helpful. A quick mental calculation or estimation will free us up for more pressing duties, thereby greatly improving overall safety. "PILOT's BASICS" is a summary of Rules of Thumb and simple formulae commonly used in aviation - basic aviation knowledge - which will enable us to perform fast, simple and accurate mental calculations. These rules and formulae result in close approximations of the normally required, but more complex, calculations. The results however are often not mathematically absolutely equal. Therefore, these Rules Of Thumb should never be a substitute for calculations in accordance with the aviation regulations and standard operating procedures. It is vital to correctly calculate and confirm critical values (such as fuel, crosswind components, and others) several times, by different means, to ensure that safety and legality is not in any way compromised. Mental calculations, without any mechanical or electronic assistance, require learning and then practice, just as we had to learn and practice when in school. Only then we will be able to use the right formula to get the right result within the often brief time available to us. But always remember the single most important Pilot's Rule of Thumb: "Everything takes longer than planned" Happy Landings!